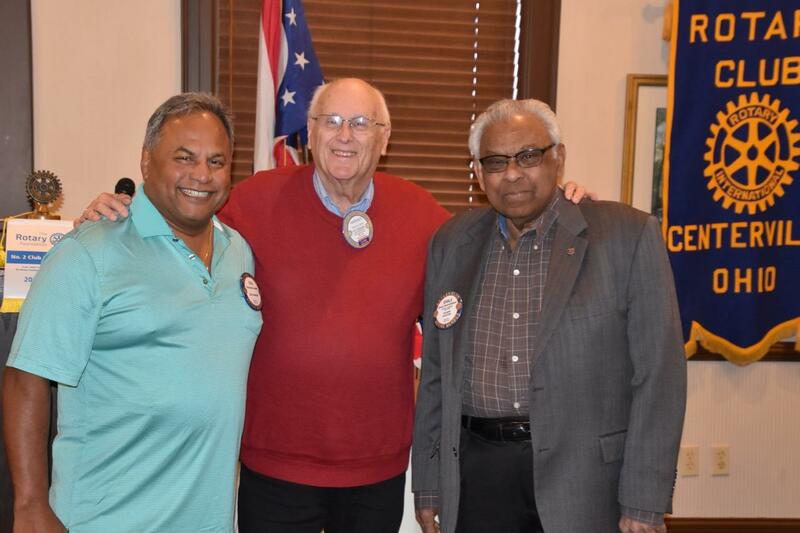 Raj Grandhi and Sivaji Subramaniam were presented with next level of Paul Harris Fellows by PDG Harvey Smith. Thank you for your generosity! 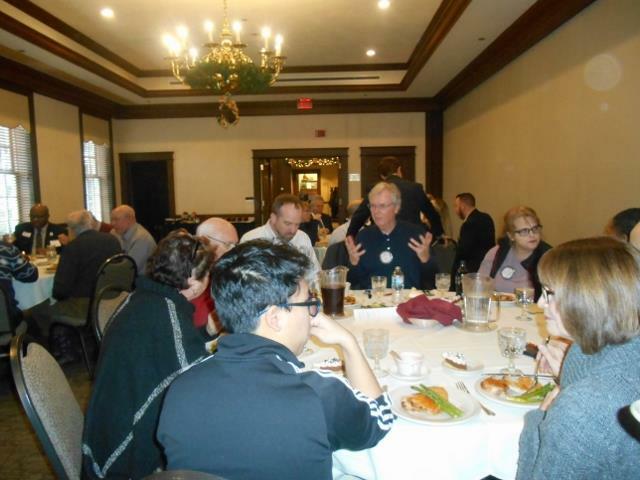 Our speaker today was Brian Martin, Executive Director of the Miami Valley Regional Planning Commission, who shared information about the region's health. barreled shotgun. But it's only a stand. 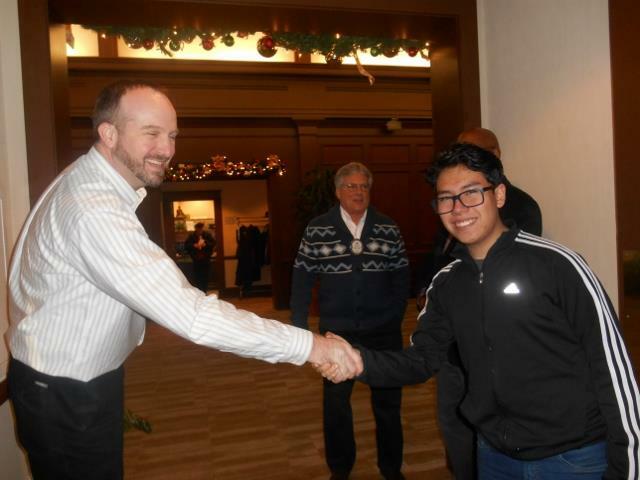 Rodrigo Garnica, our Rotary Exchange Student from Peru, a student at Centerville High School, gets an official greeting from Tom Groszko. Bob Fry is in the background. 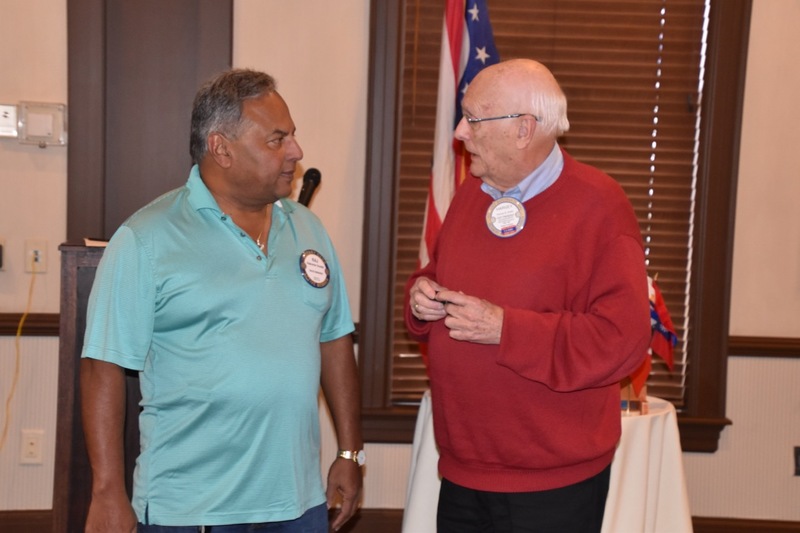 Our guest speaker for the day, Brian O. Martin (R), Executive Director of the Miami Valley Regional Planning Commission, talks with the club's Vice President Frank Perez. 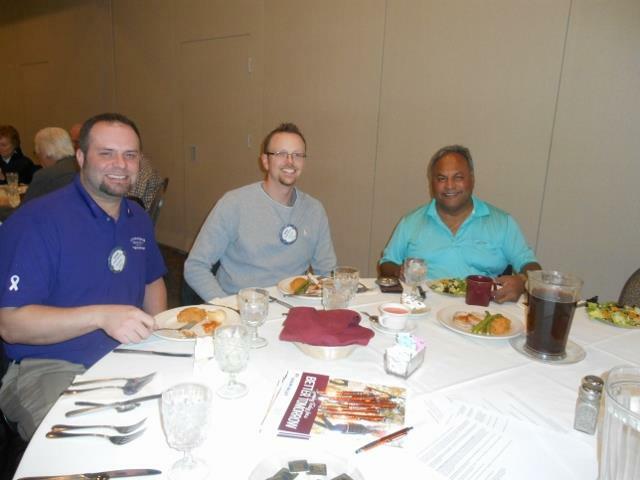 And here's another picture of our speaker, also a Rotarian, who has been in his current position at the MVRPC for the past six years. 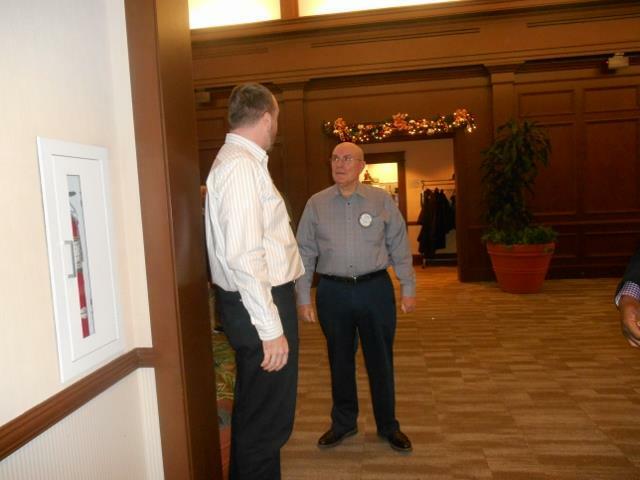 Brian and President Preston discuss matters before the meeting. Brian will serve as the Sgt.-at-Arms in place of Erich Eggers this day. He and our treasurer Gerry Eastabrooks, seen in the next picture, will collect Happy Bucks for the day. 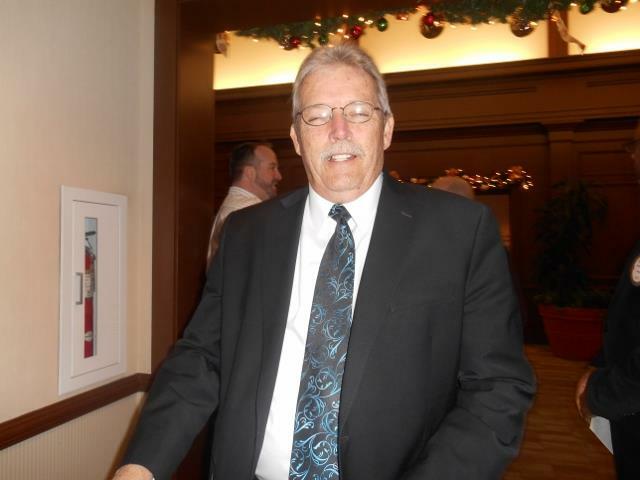 Here's our money counter, Gerry Eastabrooks, always all smiles., and a new hair-do to boot. this day, as you will see in the next picture. 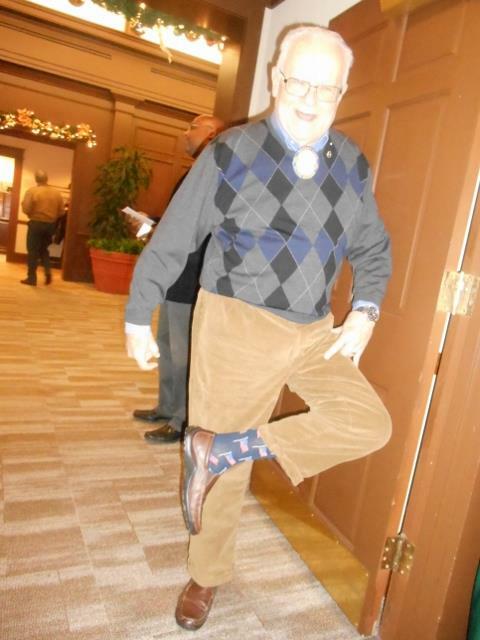 like he might be ready for an Irish jig. 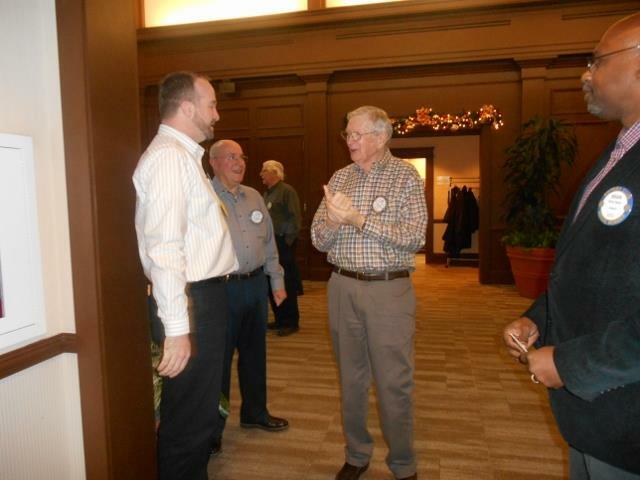 Here's President-Elect Chuck King, talking with Tom. Jim Harris gets a welcome from all. John Callander and Dale Berry chat in the entrance to Yankee Trace before coming in. 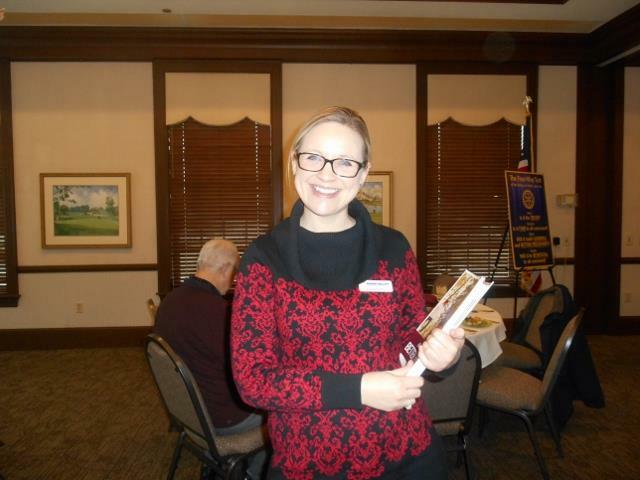 none other than Laura Henry, Marketing and Public Outreach Coordinator for MVRPC. Jim Stuart and Kisha Taylor have started a new table for lunch. in retirement, by not retiring. teams up with Rodrigo now and then to help him get all the health inoculations required by our country. Jeff Senney brings along a guest, Amber Rose, with the Kettering Medical Center Foundation, where she is Director of Annual Giving. As the noon meeting time nears, the room has begun to fill up. The tables are filling quickly now. 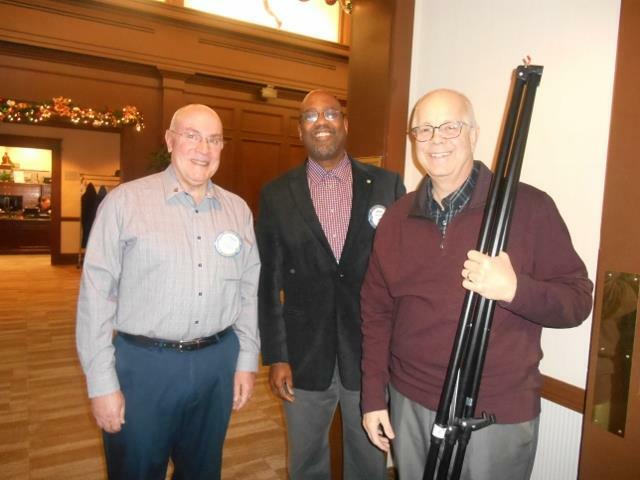 Operation Warm, the successful new winter coat program, and a letter thanking our club for helping get a water pump installed in Kenya that supplies 1,000 villagers with safe and clean water. 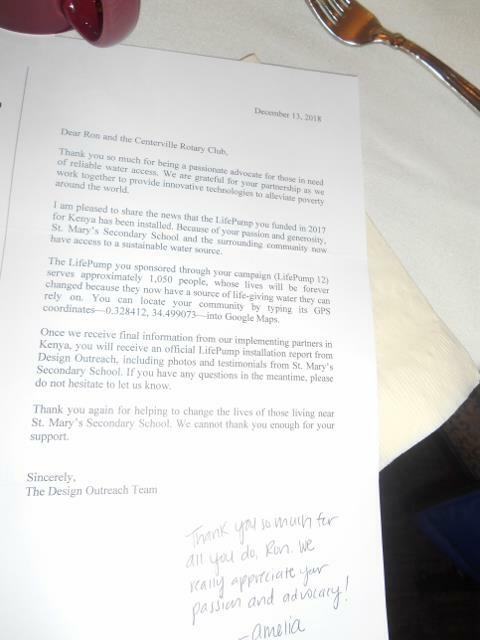 This is the letter he and the club received. 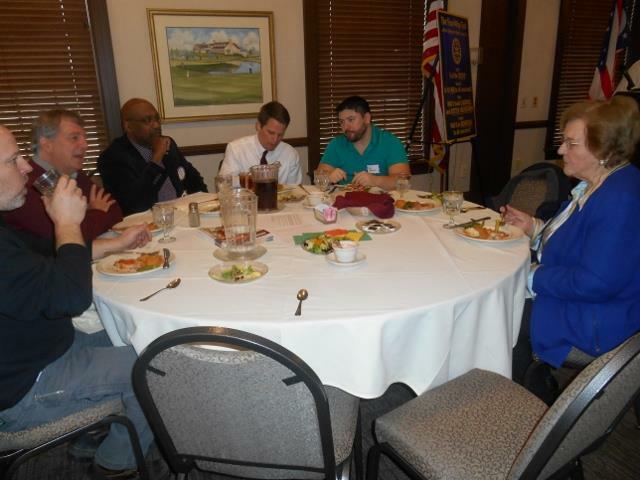 Club member John Beals sits next to our guest speaker. 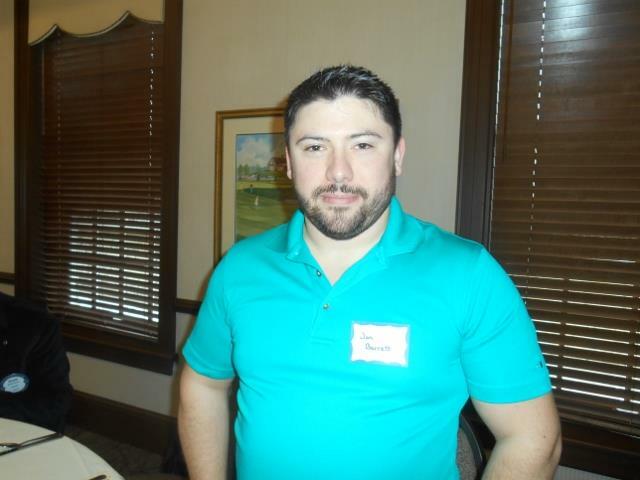 John represents Centerville, and is First Vice Chair on MVRPC's Executive Board. 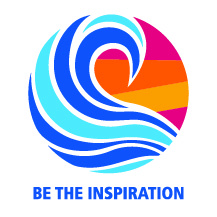 which, along with community support and sponsors, has brought in more than $40,000 in those two years, helping fund local college scholarships for area students and local and global service projects. office as a massage therapist. Breakfast Committee, and Raj Grandhi, who received a Paul Harris Fellow this day. 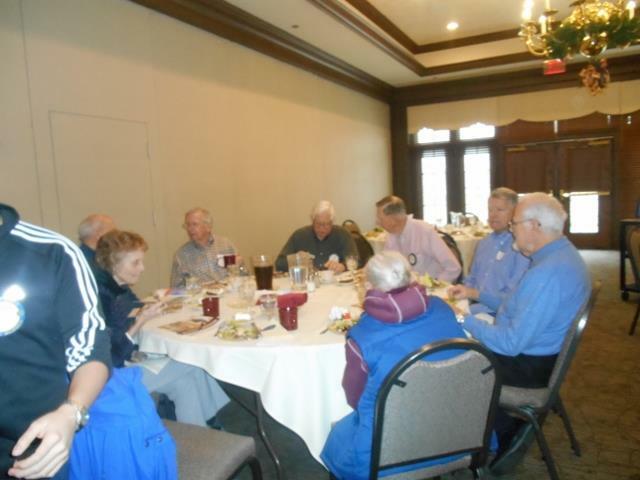 This is another table view of the lads and lassies in our club. Terry from his past years. 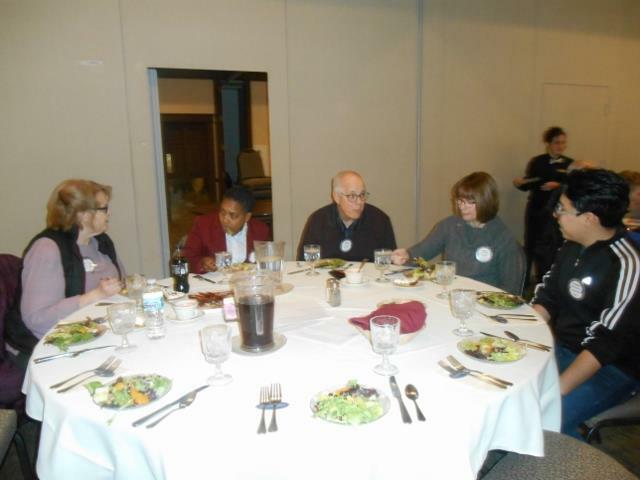 dinner, for being number two in the district in per capita giving to the Rotary Foundation. 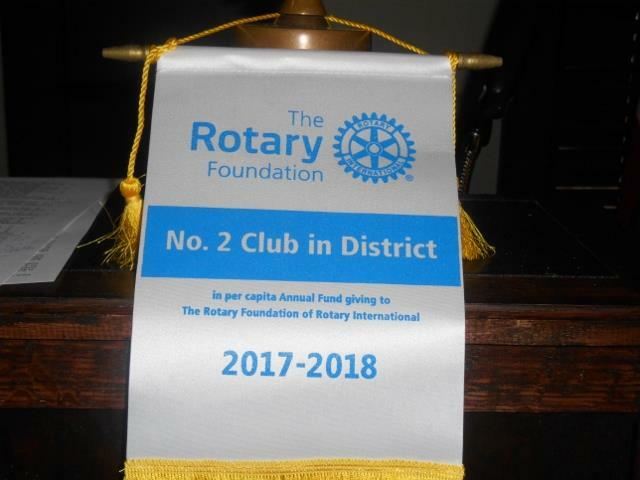 This small banner was given to the club. 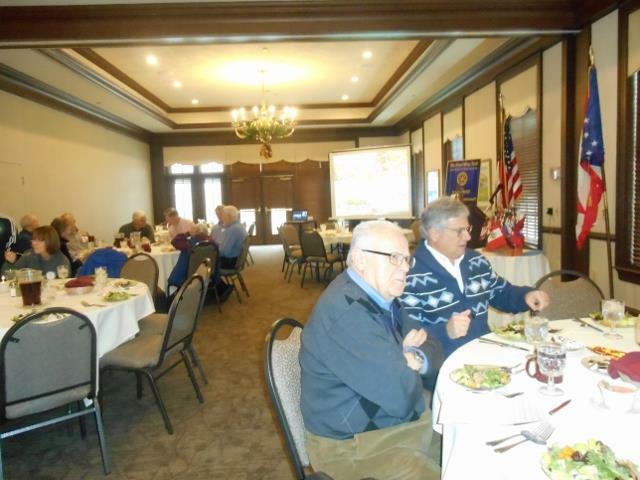 The Centerville Rotary Club met at the Clubhouse at Yankee Trace at noon. 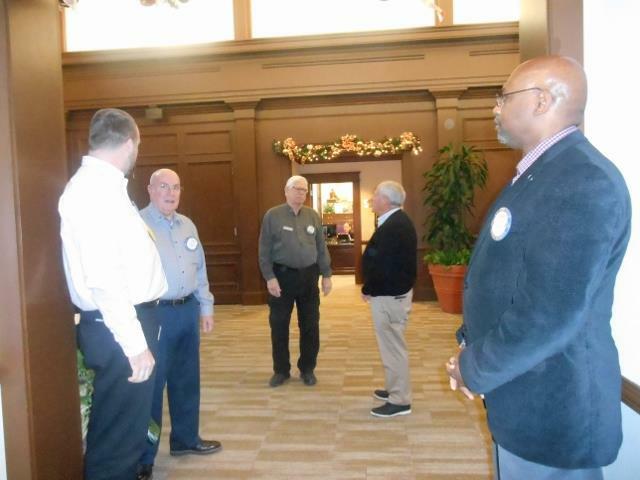 Club President Boyd Preston led the Pledge of Allegiance; Harvey Smith led the prayer; and Brad Thorp once again made us all sound good by leading the singing of God Bless America. 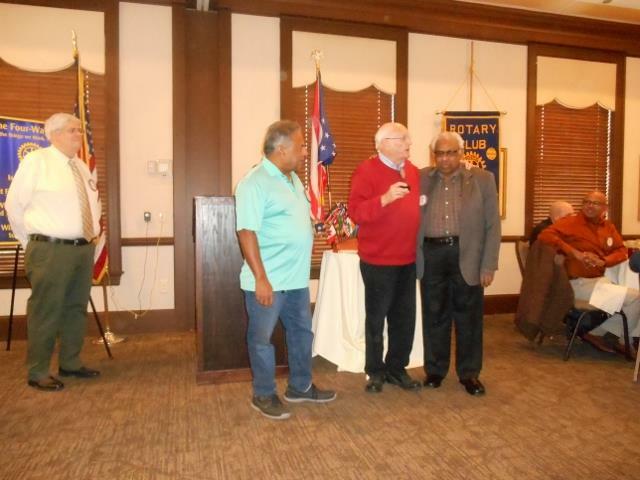 Our guest speaker noted after the singing, that the Dayton Rotary Club does not sing. 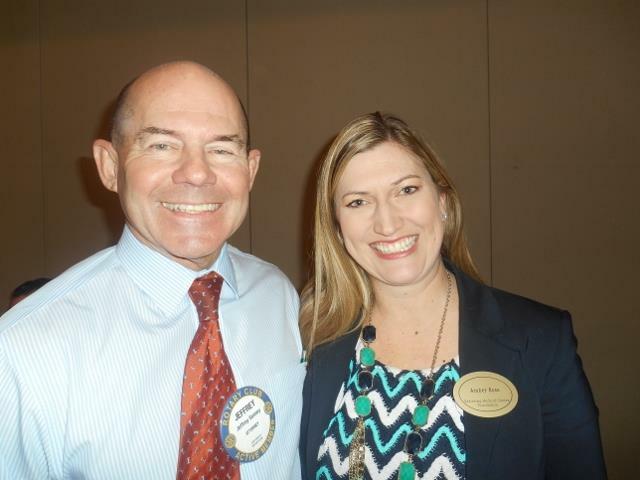 The guests at this week's meeting included: Our speaker for the day, Brian O. Martin, a member of the Dayton Rotary and the Executive Director of the MVRPC; Laura Henry, Marketing and Public Outreach Coordinator for MVRPC; Dottie Overly, wife of member Don Overly; Amber Rose, with Kettering Medical Center Foundation; Jon Barrett, massage therapist in Doc Herman's office. President Boyd thanked our greeters. 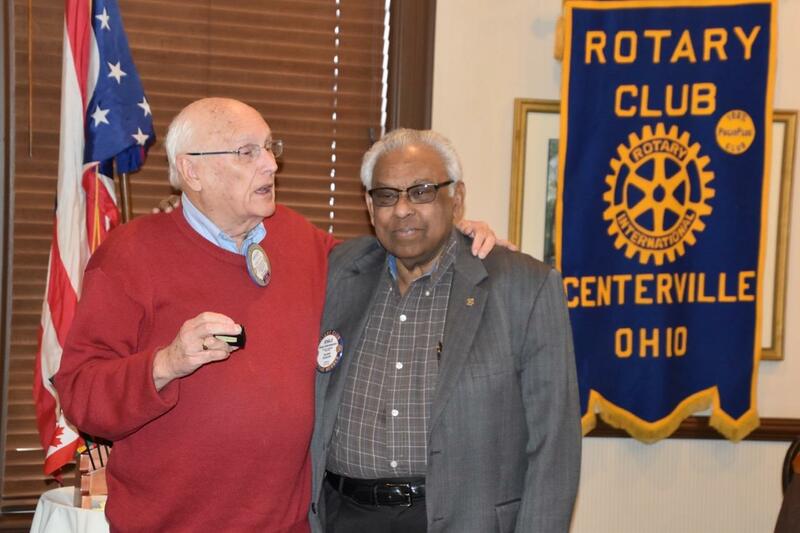 He had Raj Grandhi come to the podium to receive his Paul Harris plus one Fellow pin, from PDG Harvey Smith. Then he called Sivaji Subramaniam up also to receive his Paul Harris plus three Fellow. Raj at first said he felt like he was being called up in school for maybe doing something he shouldn't have, but then when he learned what it was about and saw Sivaji by his side, he smiled and said something about the club's ethnicity showing. 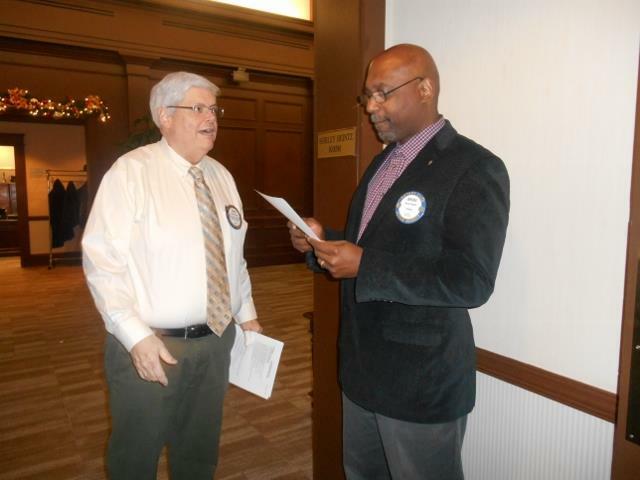 Ron Hollenbeck then got his call from our club president and told of the letter shown above about the Kenya water project. 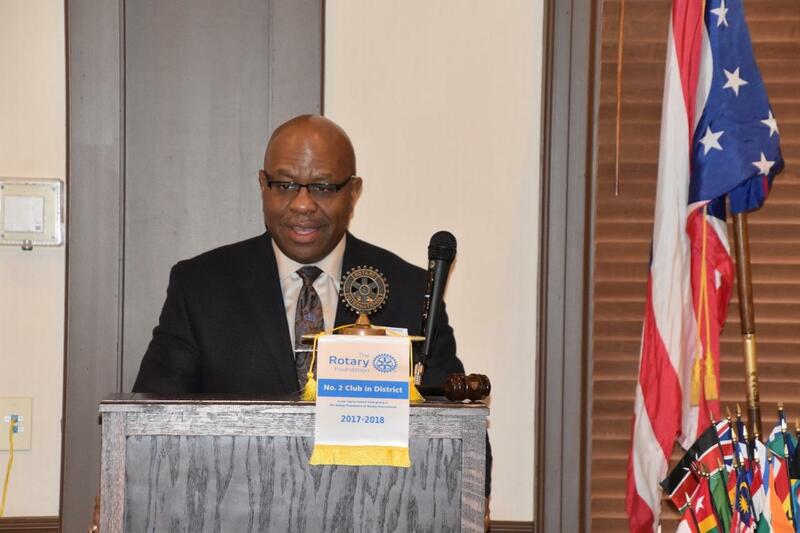 The club's most recent concentration has been on getting more water pumps into Haiti, with the help of other clubs in the district and a sought-after global grant from Rotary. 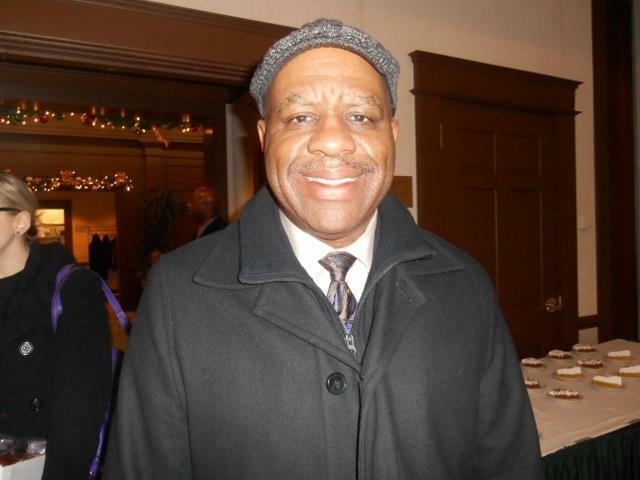 Boyd mentioned again that the annual MLK breakfast will be held at 7:30 a.m. Jan. 21 at Yankee Trace, and that the club always sponsors a table, so you should let him know if you plan to attend. He is going as the club's representative, and there is one seat left at their table. 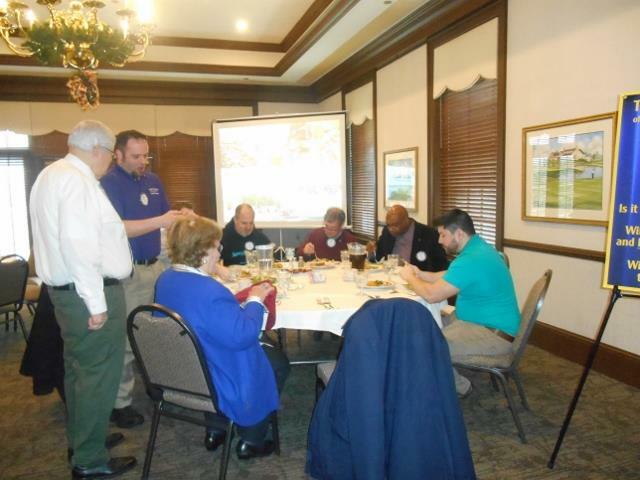 He also noted that a Grants Training Seminar will be held Tuesday, Feb. 5 at 5:30 p.m. at Normandy Church, 450 W. Alex Bell Road in Centerville. There is no cost to attend. 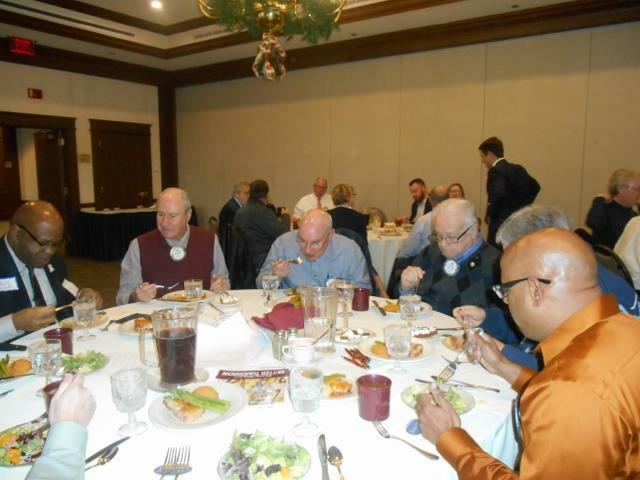 Dinner will be served at 5:30 p.m. and the seminar will be from 6 to 8 p.m.
Boyd reminded everyone of the District Conference to be held April 12/13 at the Nederland Hilton in Cincinnati. 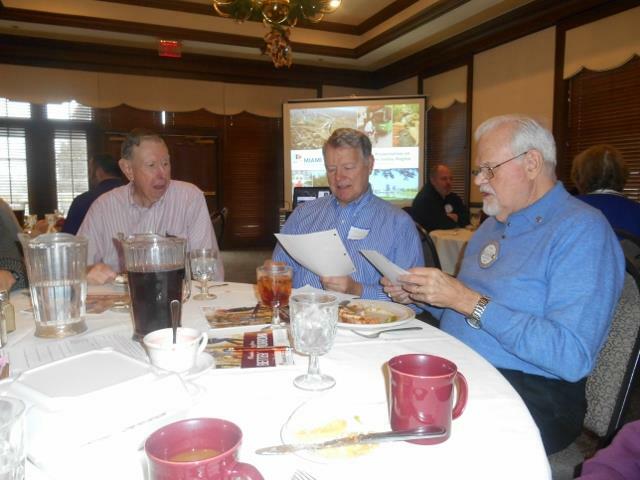 The Rotary Institute will be held Feb. l9, possibly with all three parts given, in Xenia. You can sign up for that on the District Web site. Boyd said it is great training. 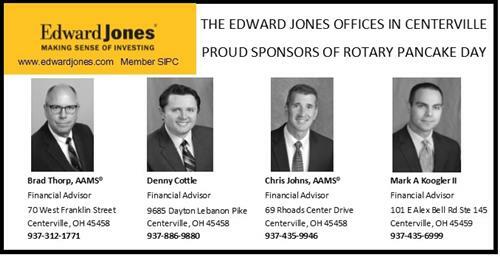 The next club board meeting is a week from Monday at the Centerville Park District headquarters off Main Street in Centerville. Boyd said he also received a thank you letter from Centerville for our support of the 50th Anniversary Celebration of the city this year. 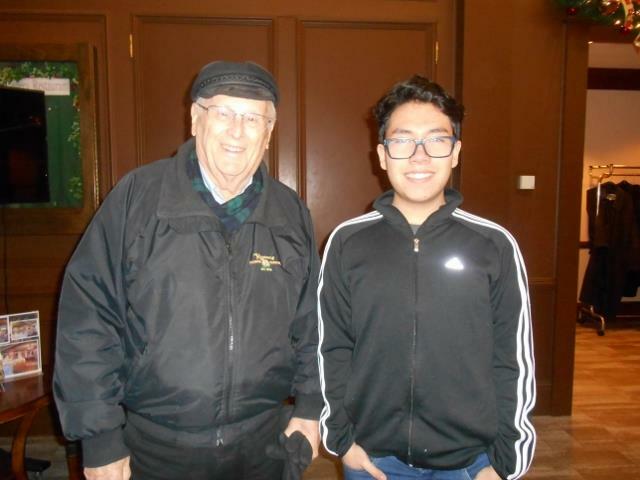 HAPPY BUCKS: The Happy Bucks this quarter will go to Honor Flight, which offers free transportation to Veterans who are not otherwise able to go to Washington D. C. to see the WWII, Korean War, Vietnam, and other war memorials there. Brian Hayes stood in for Sgt.-at-Arms Erich Eggers, noting that there were thank-you notes on the tables from students at schools where dictionaries and thesauri were distributed last year. Wayne Davis gave saying he was Happy to be recognized by Brian Martin, and Chuck King gave and Brian Martin gave for a Happy New Year, and John Beals gave for spending two weeks on the beach in Florida. Butch Spencer gave for the military veterans...Honor Flight..and Dale Berry gave for being back from his Florida stay, and Deb Dulaney said she was glad to be back, and Jeff Senney said something about Cleveland and grandbabies and Washington D.C, and having super fun and a name being pulled out of a hat that won him $20. 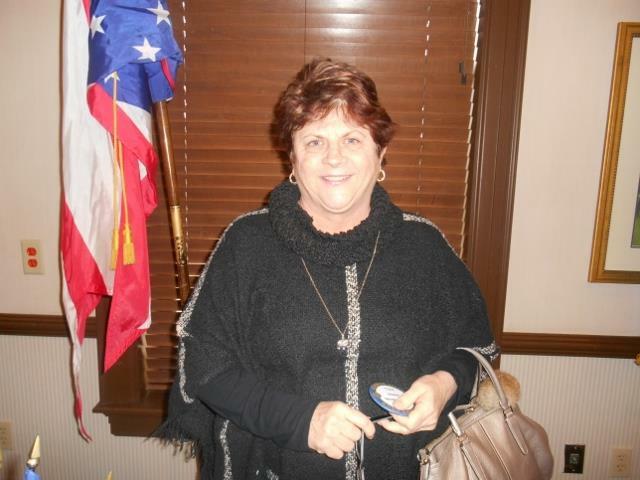 Sofie Ameloot gave for missing last week and having a birthday. Katie Neubert gave saying she was Very Happy. Ron Hollenbeck gave stating he had an e-mail from Operation Warm saying they had delivered 33,000 new winter coats through their program. He also told a funny story about a congressman cutting his thumb, etc. Tom Groszko gave and Harvey Smith gave for Rodrigo being at the club this day. the crowd who braved the winter chill to get to the club this day., right before 4 to 6 inches of snow were predicted to fall this Saturday...and are coming as I write this, though people are still getting out in the morning, as the roads are fairly clear and the road crews were on a 12-hour shift plowing and salting before most of us got up. Jim Harris gave for all the visitors here today. Terry Hanauer gave, stating he is glad to be back and at the club. Raj and Brad and Adam all said they were Happy. Boyd gave for his birthday, Sunday. Mark Gerken said he was glad to be back..and something about beef...and college...? People had gotten noisy at this point...hence the uncertainty of some happiness. Frank Perez said he was just Happy. Dan Johnson said he was Happy. Jon Barrett said he was happy to be invited and also gave for Honor Flight. 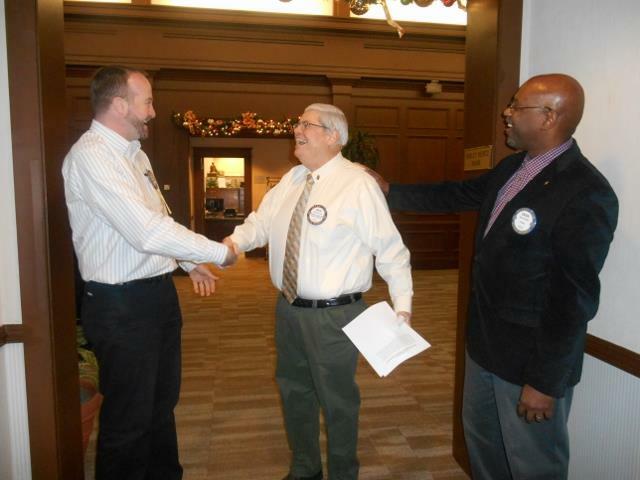 Doc Herman gave for being Happy Jon Barrett came to the meeting to see what the club is like. Sure hope he decides to come back. 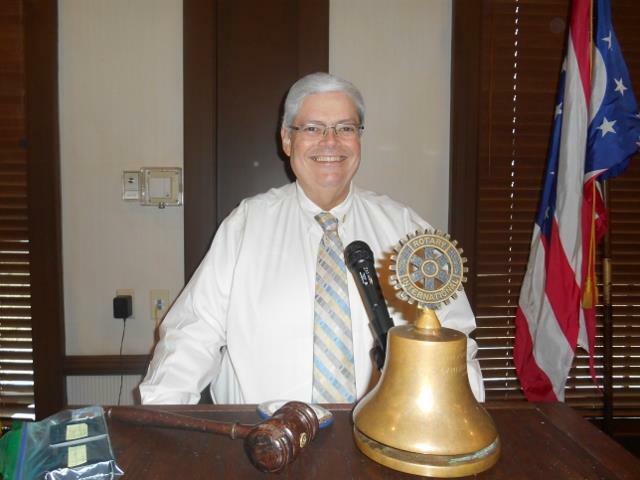 This Week's Speaker: Brian O. Martin, Executive Director of the Miami Valley Regional Planning Commission and member of the Dayton Rotary. Vice President Frank Perez introduced our speaker. 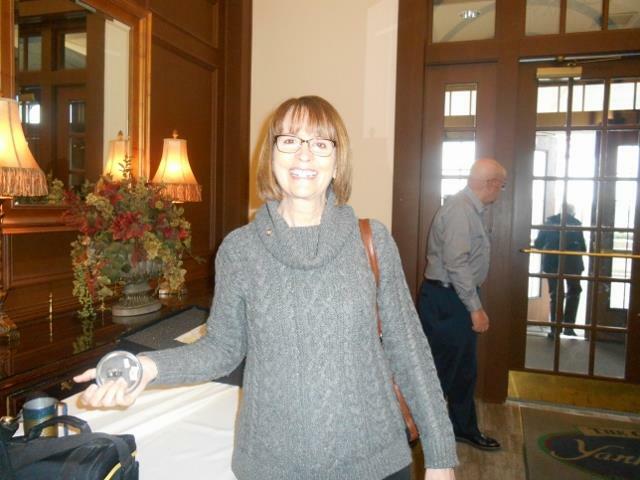 Beals for her past presence as a first vice chair on the organization's board of directors, and also her husband John Beals, who is now first vice chair, representing the city of Centerville as an executive director. 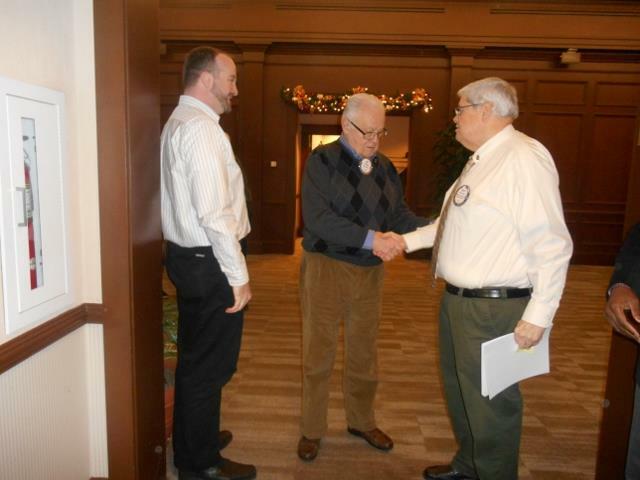 He also recognized Dale Berry and Wayne Davis for their board service. He said the MVRPC is 55 years old, having been started in 1964. He said there are 400 agencies like theirs around the country, 17 in Ohio alone. He said the agency receives Federal Gas Tax funds, which haven't been raised since 1993. He said 10 percent nationally is set aside for the agencies. The MVRPC covers five counties: Montgomery, Greene, Preble, Darke, and Miami. The boundary also includes Carlisle, Franklin, Franklin Twp. and Springboro in Warren County. The member jurisdiction is in Montgomery and Greene counties. Franklin Twp. just joined, he said. 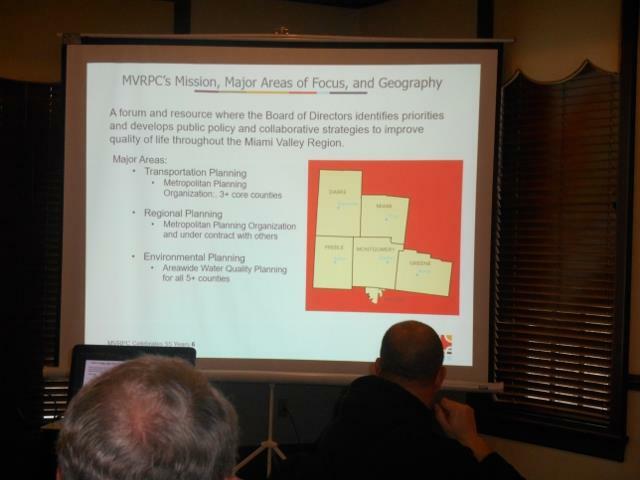 There are 77 members on the MVRPC Board of Directors, he said. There are 52 local governments represented, along with non-governmental members, like the Dayton Area Chamber of Commerce, the Dayton Development Coalition, the Dayton Metro Library, Dayton Realtors, DP&L, Inc., South Metro Regional Chamber of Commerce, Troy Area Chamber of Commerce, University no Dayton, and Vectren Energy Delivery of Ohio. 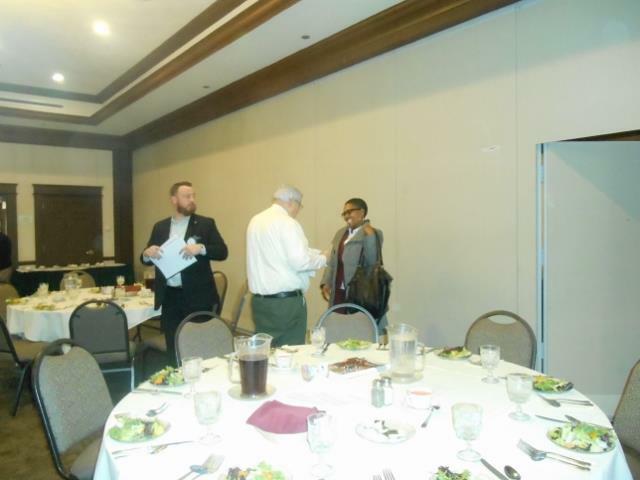 Included among the other governmental members are: Five Rivers MetroParks, the Greater Dayton Regional Transit Authority, Wright State and UD, Wright Patterson Air Force Base, Sinclair College and 11 others, including county engineers and ODOT Districts 7 and 8. Brian Martin said their meetings are held to an hour and fifteen minutes and involve issues around transportation planning and environmental planning and funding, etc. They work with the Miami Conservancy District, dealing with water issues, as 94 percent of the area's water is provided by the underground aquifer. They look after groundwater protection for the buried valley aquifer. 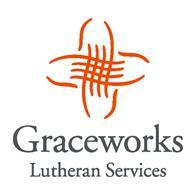 Brian said he is the sixth executive director. Nora E. Lake served longest, 20 years, he said. "February 4th is my sixth year here," he said. He mentioned the work on the I-75/I-70 Interchange with construction in 2009 on I-75. In 2017 they opened the current configuration, he said. This work made new park land available. Five Rivers Metroparks and Dayton have the opportunity to develop this, he said. They can add more trails. The Dayton Art Institute overlooks the Great Miami River, and has taken advantage of that location. In 1970 they won national acclaim for fair housing planning, he said. Sugarcreek and Bellbrook became areas for more affordable housing, which made it more decentralized, rather than all in one area, he said. Brian said this is the fortieth year for the RideShare program. A $5 million annual operating budget now includes 286 projects in the Transportation Improvement Program, he said. He mentioned improvements to off ramps from I-675 to Wilmington Pike, Feedwire Road improvements, Social Row Road and Austin Pike, etc. They have funded bike and pedestrian roadways, noting the Wright Sky Way over I-675, allowing Wright State University students to cross the highway safely. He mentioned the Round-about in Pickaway that residents first objected to and now like, and said three more are coming, the one closest to us being at Alex-Bell Road and Mad River Road in Washington Twp. They are safer and don't have the operating cost of a traffic signal, he said. He said they produced a guide map showing the Miami Valley Trails, Home of the Nation's Largest Paved Trail Network. "It's not natural, but more history," he said. It's a 340 mile network of paved trails. They update their long range transportation plan every four years. It can be found on-line at MVRPC.org, he said. They keep track of population and population movements within the area. In 2017 the population was 800,895. Employment was 424,865. The area had 30,000 less population than in 2010. The area's job creation is doing better than the rest of Ohio, he said. The Dayton Development Corporation keeps track of the workforce concentration, he said. 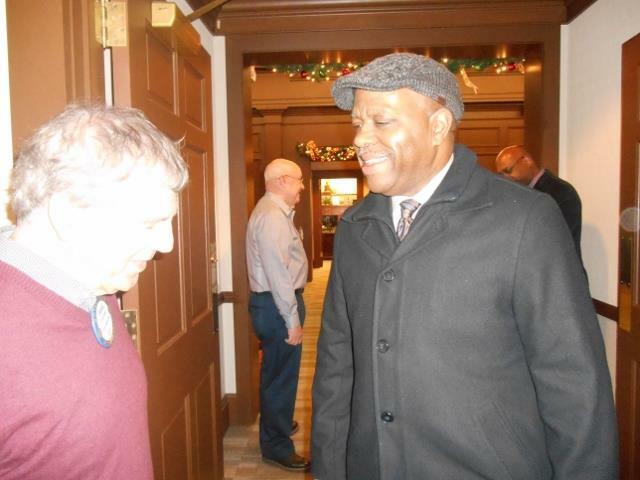 Wright Patterson Air Force Base and the health care system add a lot to our employment base, he said. Still, we are the 18th most segregated community in the country, he said. Most who grew up in the area knows that the West and East parts of Dayton have different populations, though populations move and shift as time goes by. Economic conditions of the past and present has accounted for movements of the population, with the poorer groups often living in one area and the richer in another, he said. I-675 made moving through the area in the 80s much faster, but it also shifted a lot of jobs, he said. Rural areas have suffered as well as areas with less wealth on the West and East sides of town, he said. Lots of people age in place, but others head for warmer climates. Still the Dayton area has new growth in the downtown area and the performing arts have always flourished. There are 37 performing arts organizations, Brian said. Montgomery County dropped five percent in the last census, so it's important that everyone is counted in the 2020 census, he said. 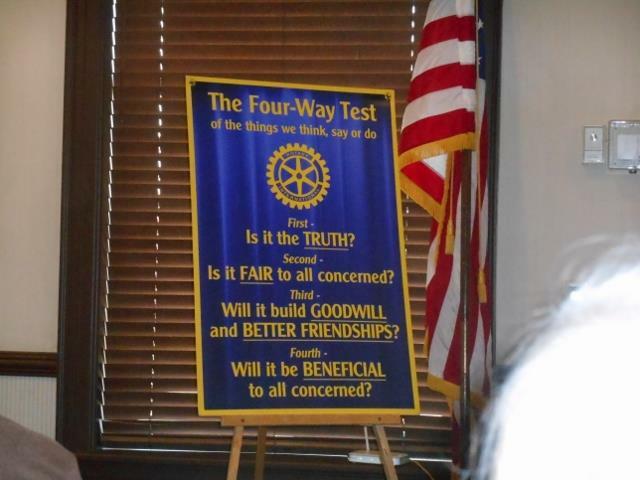 Our Four-Way Test Banner is seen below.